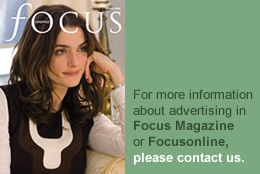 Article from FOCUS Magazine – Summer 14 issue. Property buyers are more than likely to be willing to pay a premium for a property with an outstanding view. What price a view? Well, according to Andrew Grant of Curchods’ Weybridge office, buyers are more than likely to be willing to pay a premium for a property with an outstanding view. “The old adage of location, location, location definitely applies to properties with a good view. As the saying goes: you can change the interior of your next home, but you can’t change the view that comes with it!” he says. He is selling a large house in St George’s Hill, Weybridge, on a plot of 1.66 acres and with stunning views over the tree tops as far as the London skyline. On a clear day, you can see Canary Wharf, the Millennium Wheel, Wembley Stadium and The Shard. This modern mansion has seven bedrooms, eight bathrooms, five reception rooms, an indoor swimming pool and staff accommodation. The dining room has a large semi-circular bay window, which has access to a rear balcony and the master bedroom also has a semi-circular balcony. The Mark Wilkinson kitchen is the central hub of the house and in the basement is the leisure complex with a very large swimming pool, gym, cinema room and games room. The house is on the market for £14.95 million. More than just the possibility of the view increasing the price, it should definitely help with a property’s marketability comments Howard Lowe of Sotheby’s International Realty’s Cobham office. “Amazing views will always add to the saleability of the property, as most people enjoy having a fine view whether it is in the countryside or a city. A similar property with an exceptional view will sell much faster than the same house without. If you were to take two carbon copy properties, one with and one without a view, the price would be slightly higher for that with the view. In the city, penthouses will have a premium price because of their view” he says. Lowe is selling Crow Clump, which is the major part of an original (1914) Tarrant mansion house set in the heart of St George’s Hill, bordering the golf course and with magnificent views across to the Surrey Hills. It still has the original principal staircase with galleried landing, original oak floors and exposed beams and some beautifully proportioned reception rooms each with a feature fireplace. The dining room also has mahogany panelling and there are five bedrooms, a large library/sitting room/games room and roof terrace. With one acre of grounds, multi-level water garden, children’s play area, heated swimming pool and oak framed pool house, the Grade II listed house is on the market for £3.5 million. Sotheby’s is also selling Graffham Court, near Petworth. This is a fine late 19th century stone house set in 132 acres with long views towards the South Downs. The house has two reception rooms, study, library and orangery, games room and wine store in the basement and four bedroom suites. Within the estate is a triple garage, two cottages – one with two bedrooms, the other with three bedrooms – stabling, additional outbuildings, stick and ball polo ground (it is near Cowdray Park after all), all weather manège, exercise track, paddocks, extensive woodland with potential cross country course. There is also a heated swimming pool, which is currently unused. The guide price is £6.95 million. A much smaller home with a view is being sold by Featherstone Leigh in Ham. Camilla Cottage is a charming detached two bedroom house, with views from the upstairs rooms straight across Ham Common. During the summer, you are perfectly placed to watch the cricket being played there. With a secluded patio garden, small conservatory and off-street parking behind private gates, the cottage is on the market for £1.1 million. This apartment at One Hyde Park is the only complete floor for sale that is ready to live in immediately. The apartment occupies the entire floor and boasts magnificent views of both Knightsbridge and Hyde Park. At night, the sight is awe-inspiring. The interior design of the apartment responds both to its unique size of over 9,000 sq ft as well as its location. The apartment is divided into two wings; the 5 bedrooms can be found in the city wing whilst all the living and entertaining spaces are in the park wing. The impressive 65 metre hallway which stretches from the park side to the city side connects both wings, forming the spine of the apartment. The Candy & Candy interior design team has taken inspiration from the two diverse perspectives of London, which uniquely combine in this apartment, to provide a truly modern interpretation of sophisticated and luxurious city living. The cost? A staggering £68 million. “A view in Central London is what most buyers aspire to – either of a great Cityscape, the River or open spaces and greenery! 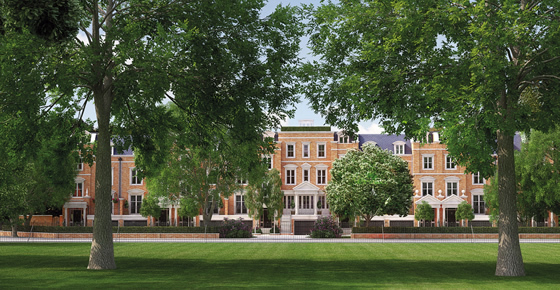 The magical formula of One Hyde Park is combining a bustling, central location with a flat that because of its height in the building takes the buyer out of the bustle and connects them with the green open spaces of the Park” says Howard Elston of Aylesford, which is marketing the apartment. Hamptons is selling a modern detached home on three floors, with excellent rural views across the fields to Guildford. The dining room, kitchen/breakfast room and drawing room all have doors onto terraces and there are five bedrooms, with the master bedroom having an en-suite bathroom and dressing area on the two floors above. The property is on the market for £1.7 million. Another splendid house is Hatchford End in Ockham, near Cobham. This seven bedroom 18th century brick and flint house has been extended over the years and to complement the high ceilinged formal reception rooms, sweeping staircase and very pretty garden room in the main house, it also has an annexe with two bedrooms, barn which has been converted into a large studio space with kitchenette and new pavilion, which has one bedroom, living room and kitchen. There are lovely views across its 8 acres of parkland grounds, in which there are also stables, a tennis court and swimming pool. The property, which still retains many original features, is on the market through Strutt & Parker Guildford’s office for £5.95 million. The same office is selling a five bedroom modern house at Compton Heights, near Guildford with out-standing views of the Surrey Hills from most aspects of the house. With open plan kitchen/family room/dining area, drawing room, study and gardens of around 0.5 acres, the guide price is £1.5 million. One of the most quintessential English views must be from Long Walk Villas on the edge of Windsor Great Park. This is an Octagon development of nine townhouses. 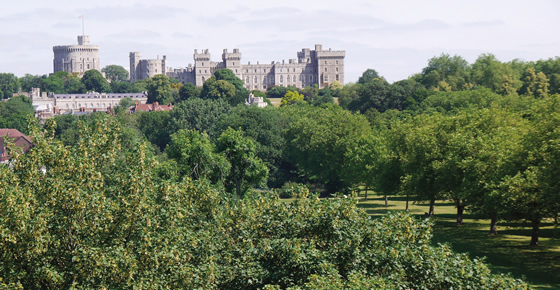 The large five bedroom family homes overlook the Long Walk (hence the name) and from each roof terrace, there is an excellent view across to Windsor Castle. 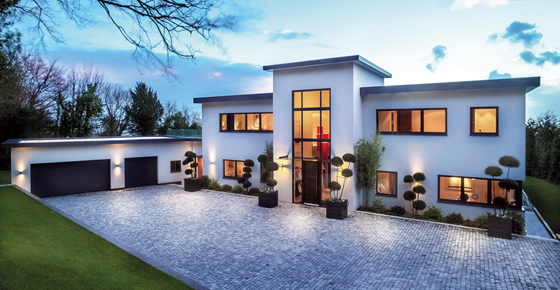 Each house has its own integral garage and private rear garden, contemporary Miele kitchen, family room, drawing room and dining room. Hamptons are selling the houses from £2.75 million. Another stunning property from Octagon, Fernbank is located on the exclusive Coombe Hill Estate, Kingston upon Thames and securely tucked away behind secure video controlled entry gates at the end of a leafy private cul de sac. Fernbank is a large six bedroom house with drawing room, dining room, study, TV room and family room, plus games room and a second floor living area with roof terrace, from which you have views across the fairways of Coombe Wood Golf Course. With lift, splendid glass and marble spiral staircase, integral garage and large landscaped garden, the house is on the market through Knight Frank for £6.75 million. A new Millgate development of nine homes have really fabulous views over three counties on Trevereux Hill, near Oxted in Surrey. There are two traditional five bedroom country homes set alongside a striking contemporary house, called Chart Ridge and six two and three bedroom penthouse apartments in an impressive building called Trevereux Place. Chart Ridge is in Art Deco style with a stone and glass staircase and contemporary interiors. This is on the market for £3.6 million. The two more traditional houses are priced from £3.5 million and the apartments from £1.05 million.